Brass Eye | Life Is Absurd. Don't Fight It. I logged in to my Twitter account the other day, prior to setting up a dedicated account for this blog in order to try and reach a wider readership. So far, the blog page is being followed by ten people, and is not yet what you might call a roaring success. If you are on Twitter, you can help me change that if you are so inclined. Please be inclined. I always have a quick look at my Timeline, to see what people I follow are posting, before switching to the “Interactions” page so as to avoid being swamped by a million new-tweet notifications. This has changed now that I have begun using Tweetdeck to manage my personal account, this blog’s account, and the account for my “Adventures In The World Of Stand-Up Comedy” blog. However, that was my routine on the day in question. The top of my Timeline was filled with retweets from comedian Sarah Millican, and from them it was fairly evident that she had posted about swallowing her chewing gum. Most of the “funny” answers had already been given and, as I have an aversion to being in any way “hack” with my jokes, I was prepared to skip straight to the page telling me how little I had been socially interacted with since last signing in. That was when I noticed the tweet I was drawn to reply to. I tried to find a clip of that particular jingle, with no luck, but I did find this track by Kunt And The Gang. They appear to be offering sexual favours in return for a high chart position. That last quote, from “Doctor” Fox, is one of many that I can easily recite verbatim. Here he was on Twitter, espousing an obviously nonsensical “fact” in reply to Sarah Millican’s tweet, and I replied without a second’s hesitation – quoting his own assertion about facts and evidence. I did not expect a reply – I figured it would be an episode of his life that he would be embarrassed to be reminded of, since various celebrity interviewees later denounced the show while publicly expressing their anger at being duped. 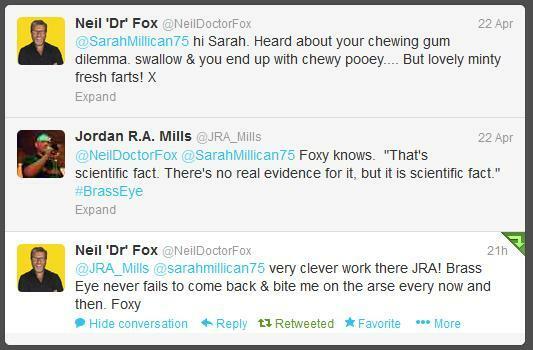 I did not anticipate a reply from Sarah Millican either, as she has previously ignored me. Kind of. We have a mutual friend, a professional comedian who once publicly posted the link to my film “Jerry Generic” – which is a short satire of stand-up and of hack jokes and topics. Ms. Millican “replied” to it, but only insofar as to send an unrelated tweet to the friend off the back of it. I saw it as I was named in the original tweet, but the reply was not directed at, and did not concern, me. I presumed that it was easier to tack a new message onto that one rather than hit the “compose” button, and took that communication to be an act of convenience rather than a personal slight. It came as some surprise, then, to find a reply from Foxy a few days later. He had taken my tweet in his stride, seeming to praise me for making the reference, and candidly referring to the occasional repercussions of his appearance on that show. I accepted that at face value and decided not to reply further – instead resorting to just retweeting it for others to read. A Delivery Company Who Just Don’t Deliver. Like A Virgin, Train Cancelled For The Second Time. All text copyright © Jordan R.A. Mills. No text may be reproduced without written permission. All rights reserved.